Home » Who says cookies can’t be good for you? Who says cookies can’t be good for you? It might seem strange given the subject of this article, but I’m not actually a huge biscuit fan. This does have one big caveat: I’m quite partial to a freshly homemade cookie. I especially like one full of good stuff rather than lots of indecipherable additives. I also enjoy making biscuits and experimenting with gluten-free flours (I unfortunately have to avoid eating too much wheat because of digestive issues!). One of my favourite non-wheat grains is oats (gluten free ideally). In my world, porridge isn’t just a cold morning activity – I’m happy to have it for breakfast at any time of the year, and sometimes even as a sneaky dinner. I also bake with oats. They add a nice chewy texture to cookies. You can even blend them to use as flour. I buy organic oats as I’m really concerned about the levels of pesticides and other nasties that go into the production of cereals. I’m pretty sure the planet could do with a few less toxins being dumped on it. This is why I’m so supportive of the Organic September campaign. It has a very clear message of making simple organic swaps, which in totality will add up to something much bigger. I find having my weekly organic Abel and Cole box makes it easy for me to choose organic without having to spend a fortune doing it. However you can do something smaller. It could mean simply swapping your porridge, eggs or flour for an organic alternative in September. To celebrate Organic September, Planet Organic created a chef challenge for the Health Bloggers Community network. 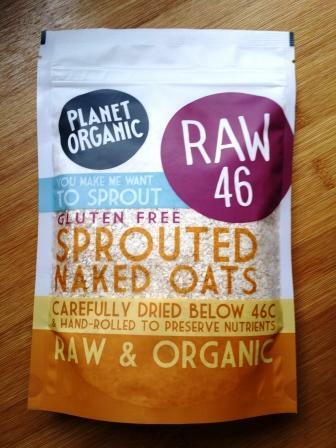 The task was to create something tasty using Planet Organic’s raw sprouted oats, which Planet Organic supplied. Given the challenge involved oats and organic ingredients, I jumped at the chance to take part. As I was in a baking kind of mood (I think it must be the Great British Bake Off effect), my first thought was to make some cookies. I also wanted to use an ingredient that gets a bit of a bad rap: peanut butter. Peanut butter tastes great and is full of good fat. Of course you shouldn’t go overboard with it, but it isn’t something you should automatically think of as unhealthy. I do however avoid any peanut butter that adds sugar, palm oil or vegetable oil. Look for one that’s either 100% peanuts or has just a touch of salt added. We often have a jar in the cupboard as my husband, who is a long distance runner, uses it for good calories, fat and protein on his big runs. I was also feeling inspired by a recent peanut butter and raspberry chocolate I tasted at Paul A Young in Soho. It’s a delicious take on the US favourite of peanut butter and jelly (or jam in our language). There’s something very comforting about earthy peanuts with sweet jam. Raspberries are the perfect partner as they’re in season at the moment and there are some lovely sweet varieties to choose from. 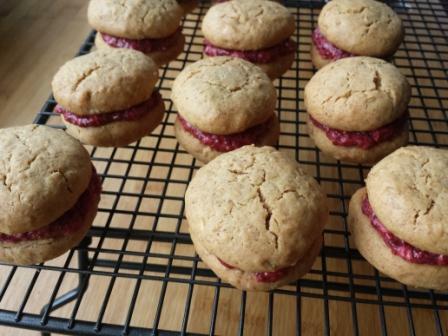 I therefore created my own version of a peanut butter jelly, or PBJ, sandwich in cookie form. The cookie sandwich looks almost like a cookie version of a macaron. 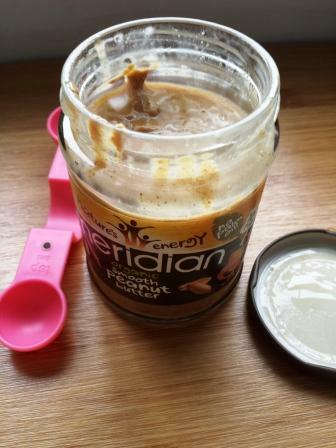 It has fresh fruit, some good protein and good fat from the peanut butter, and no refined sugar. Oh, and it just happens to be gluten free. But, most of all, I think it tastes really good. I’d love to hear if you agree. 1. Preheat your oven to 180°C (160°C for fan ovens). Line 2 baking trays with baking parchment. 2. Start by preparing the filling. 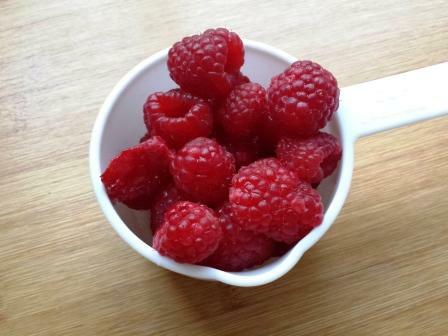 Put the raspberries, maple syrup and water in a small saucepan, and bring to a gentle simmer over a medium heat. Simmer for 5 minutes, stirring occasionally, until the mixture thickens a little. You may need to crush the raspberries a bit with a spoon. 3. Take the saucepan off the heat and stir in the chia seeds and coconut oil until everything is combined. Leave the mixture to cool. 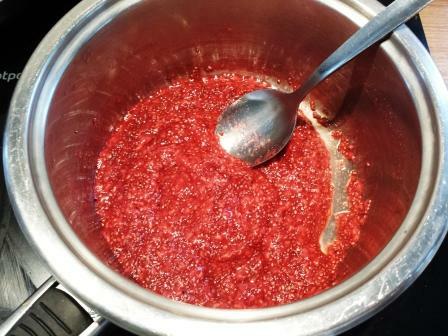 The chia seeds will swell and leave you with a nice jammy raspberry mixture. 4. 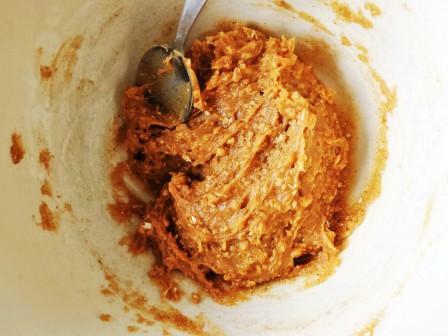 In a large mixing bowl, mix together the peanut butter, maple syrup and olive oil into a smooth paste. Stir in the egg and vanilla extract. 5. 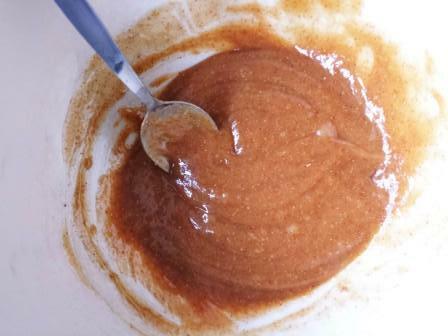 Sift the rice flour, corn flour, baking powder and salt over the peanut butter mixture. Stir everything in until it’s just combined. Add the oats and mix again so that the oats are evenly spread through the cookie mix. 6. Take small amounts of the dough (about a couple of teaspoons) and roll it lightly between your palms into a ball. Place on the trays and gently press the tops with your fingers to flatten slightly. 7. 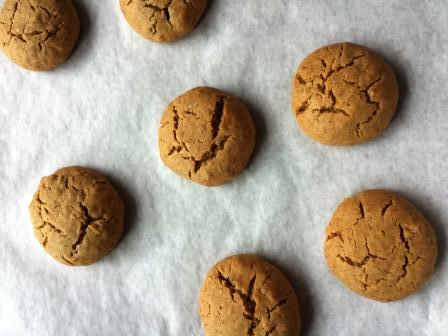 Put the trays in the oven and bake for 20 minutes until the cookies have turned a light golden colour. 8. Remove the cookies from the oven and them to cool on the trays for 5 minutes. Take the cookies off the trays and leave on a wire rack to cool. 9. 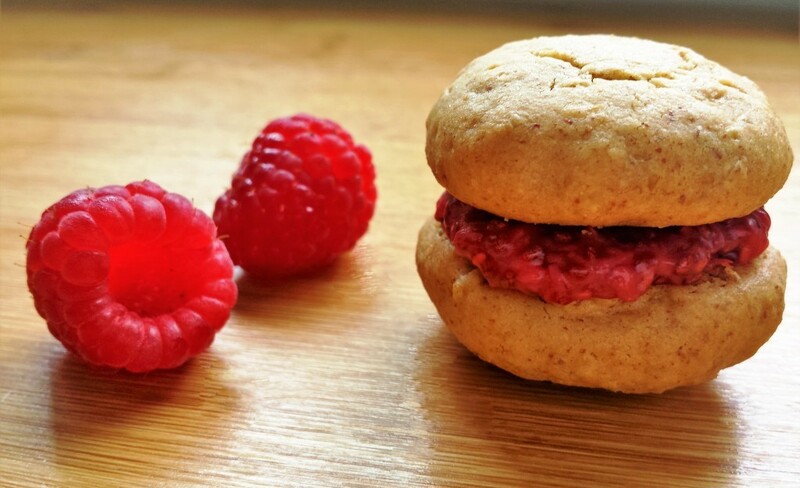 To create each cookie sandwich, scoop a little of the raspberry filling onto the bottom of one biscuit and spread it to cover the base. 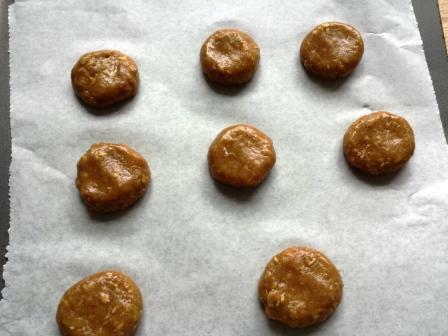 Place another cookie, bottom-side down, over the filling and gentle press together. (Use a light touch as you don’t want the filling to explode out the side of the cookies – I recommend twisting the top cookie slightly as you press them together to let the filling settle properly). The cookie sandwiches will keep in an airtight container for 1-2 days. You can keep the cookies longer without the filling (3-5 days). If you’re not planning to eat them straight away, hold off assembling the cookie sandwiches until the day you’re going to eat them. It goes without saying that you should try to use as many organic ingredients as possible when making the cookies – definitely for September, and then beyond if you can. Do you like this recipe? If so, please share it with other cookie lovers!